Every ASP.NET web form control inherits the DataBind method from its parent Control class, which gives it an inherent capability to bind data to at least one of its properties. This is known as simple data binding or inline data binding. Simple data binding involves attaching any collection (item collection) which implements the IEnumerable interface, or the DataSet and DataTable classes to the DataSource property of the control. On the other hand, some controls can bind records, lists, or columns of data into their structure through a DataSource control. These controls derive from the BaseDataBoundControl class. This is called declarative data binding. The data source controls help the data-bound controls implement functionalities such as, sorting, paging, and editing data collections. Simple data binding involves the read-only selection lists. These controls can bind to an array list or fields from a database. Selection lists takes two values from the database or the data source; one value is displayed by the list and the other is considered as the value corresponding to the display. Let us take up a small example to understand the concept. 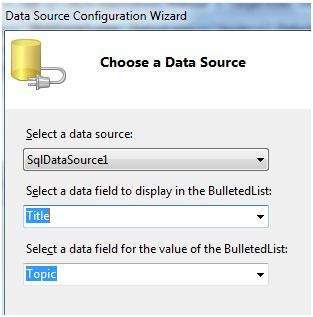 Create a web site with a bulleted list and a SqlDataSource control on it. 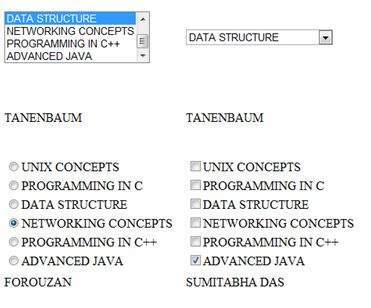 Configure the data source control to retrieve two values from your database (we use the same DotNetReferences table as in the previous chapter). 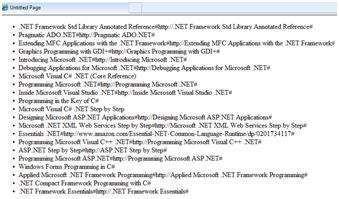 When the application is executed, check that the entire title column is bound to the bulleted list and displayed. We have already used declarative data binding in the previous tutorial using GridView control. The other composite data bound controls capable of displaying and manipulating data in a tabular manner are the DetailsView, FormView, and RecordList control. In the next tutorial, we will look into the technology for handling database, i.e, ADO.NET. A dataset that stores the data retrieved from the database. 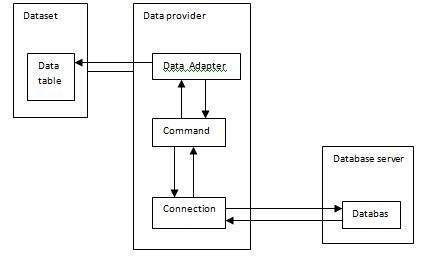 The data provider, which retrieves data from the database by using a command over a connection. The data adapter that issues the select statement stored in the command object; it is also capable of update the data in a database by issuing Insert, Delete, and Update statements. Step (1) : Create a new website. Add a class named booklist by right clicking on the solution name in the Solution Explorer and choosing the item 'Class' from the 'Add Item' dialog box. Name it as booklist.cs. The booklist class has two properties: bookname and authorname. The createbooklist method is a user defined method that creates an array of booklist objects named allbooks. The Page_Load event handler ensures that a list of books is created. The list is of IList type, which implements the IEnumerable interface and capable of being bound to the list controls. 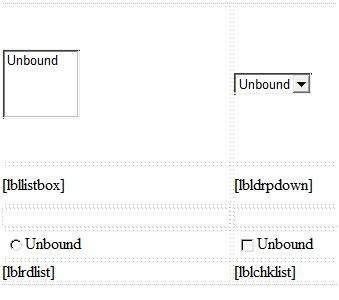 The page load event handler binds the IList object 'bklist' with the list controls. The bookname property is to be displayed and the authorname property is considered as the value. When the page is run, if the user selects a book, its name is selected and displayed by the list controls whereas the corresponding labels display the author name, which is the corresponding value for the selected index of the list control.